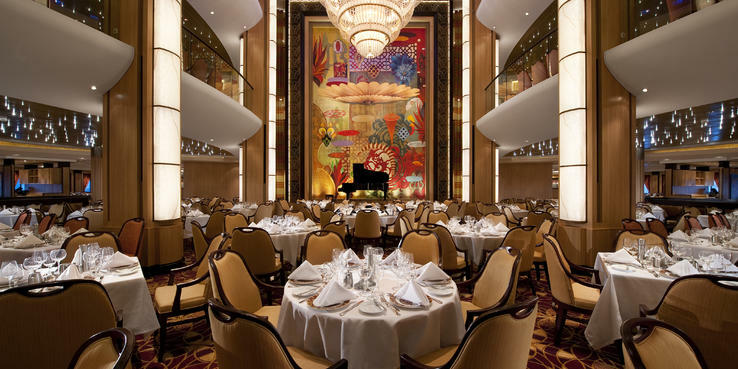 Dining on Mariner of the Seas is one of the ship's top highlights. It seemed that everywhere we turned, there was something tasty to eat or drink. Windjammer Marketplace, the ship's buffet option, wasn't just steam-table fare; we were surprised by the freshness, flavor and variety offered at each meal. As you might expect from a cruise sailing from Miami, with an emphasis on the Miami market, the Latin food offerings at breakfast, lunch and dinner were tasty and plentiful. Will they stack up to what you can get at a true Latin restaurant? Not necessarily, but they won't disappoint. Another thing that did not disappoint were the snacks. Windjammer was open late (10 p.m. to midnight), and the Royal Promenade's Cafe Promenade had snacks available at all hours of the day. The primo dining experiences onboard occur in Mariner of the Seas' three extra-fee alternative restaurants: Chops Grille; Jamie's Italian; and Izumi Hibachi & Sushi. Reservations are recommended for the specialty restaurants (with the exception of Johnny Rockets), especially on the short, three-night sailings. The most popular restaurants tend to book up quickly. Royal Caribbean offers all-you-can-drink soda cards (prices determined by length of cruise with an average daily cost of $8 per day, plus gratuity), and each package comes with a souvenir cup. There are Coca-Cola Freestyle machines (self-serve drink stations with dozens of drinks and variations to choose from), but they require the souvenir cup to operate, so if you thought you'd skip the soda package and just get a drink or two on the sly, you can't. Dining Room (Decks 3, 4 and 5): Mariner of the Seas' main restaurant spans three decks and sports a musical theme. From the moment you walk in, the space astounds. The soaring ceiling and appropriately oversized chandelier draw the eye up and into the space, while the curves of the balconies on each level direct your gaze around the room. While it's possible to find a table for two in the dining room, those tables are coveted and hard to come by, with most set for four, six or eight. The restaurant is open seating for breakfast and lunch every day, and it's often crowded. Breakfast is a la carte, and the menu has the usual items: eggs, omelets, yogurt, granola. The omelets were served quickly, packed to overflowing with fillings, and served with some pretty good coffee. For dinner, choose between assigned early (6:30 p.m.) or late (9 p.m.) dining, or opt for Royal Caribbean's My Time Dining, which allows you to pick a preferred mealtime between 6 and 9:30 p.m. You'll need to call ahead for reservations when opting for My Time Dining, but it's generally not difficult to get the time you want. Cuisine in the dining room is properly prepared and tasty, though the options are standard cruise fare and therefore not overly inventive. (Those seeking something more adventurous and inventive generally seek out the specialty dining venues.) Options might include a steak with fries, a pair of fish preparations, pasta, salads, soups, appetizers like escargot and dessert. There are healthy options available, as well as vegetarian dishes. Windjammer Marketplace (Deck 11): Windjammer Marketplace, Mariner of the Seas' buffet restaurant, is open for breakfast (6:30 a.m. to 11 a.m.), lunch (11:30 a.m. to 3:30 p.m.) and dinner (6 p.m. to 9:30 p.m.), as well as for late-night snacks from 10 p.m. to midnight. The food at Windjammer is a step above the steam-table fare you often expect from the buffet, and the specialty sections -- Latin one day, Indian or pan-Asian another -- were hits with our fellow passengers. Other options included steaks, baked potatoes and fixings, and traditional American sides (green beans, sauteed spinach). Despite being well done, they were tender and tasty; trays were constantly being replenished, which added to freshness. Other stations included meats and cheese; fruit and dessert; and chicken, pork and roast carving stations. It was always easy to find a table for two or four, even near windows, but for parties of eight or more, larger tables were harder to come by. Boardwalk Dog House (Deck 11): The Boardwalk Dog House serves frankfurters, brats, sausages and sides like potato salads. It was a popular option with kids -- and easy, too, as this venue is adjacent to the pool -- but also with adults who wanted a light meal or heavy snack in the afternoon. Arctic Zone (Deck 11): More of a snack station than an eatery, Arctic Zone serves soft-serve frozen yogurt (vanilla, chocolate and swirl) in cups and cones. Cafe Promenade (Deck 5): Cafe Promenade, located on the Royal Promenade, is set up for round-the-clock food. In the mornings, you can get croissants, Danishes and fruit; in the afternoon and evening, there are sandwiches, pizza, cookies, cakes and fruit on offer. A self-serve station features fresh-brewed coffee, tea and hot chocolate, but if you want an espresso or latte or something spiked with a little liquor, you need to visit the cafe-bar next door. Room Service: While there's no charge for room service menu items, delivery carries a fee of $7.95 per order. The menu features kid-friendly items, as well as indulgent and healthy options (French fries to salads), plated meals like grilled salmon, and pizza and burgers. Izumi Hibachi & Sushi (Deck 4); a la carte: This Japanese restaurant serves hibachi cuisine, as well as sushi and sashimi; sake and cocktails are also available. We couldn't get near this place during our special two-night sailing, but looking in, it was smart and chic, and the diners at the hibachi tables were having fun eating their appetizers while one cook balanced an egg on the end of his spatula and the other drummed away on the flat-top. On the sushi menu are the usual nigiri, sashimi and maki offerings like tuna, yellowtail, salmon, eel, shrimp and amberjack, but the chefs take a creative approach to these ingredients. The California roll is served in soy paper instead of rice, there's a lobster roll with Champagne sauce and dried chili threads, and the tuna in the tuna tataki roll is seared before it's served and then topped with a garlic ponzu sauce. Dessert is decidedly Japanese, featuring mochi ice cream -- ice cream wrapped in a rice flour coat. Due to the popularity of Izumi, we recommend making reservations as soon as possible. Prices range from about $6 to $16. Playmakers Sports Bar & Arcade (Deck 5); a la carte: Playmakers Sports Bar & Arcade is just that: a sports bar with a small collection of arcade games. It serves beer and cocktails and a selection of bar food favorites like wings and sliders. Nearly everyone we saw in Playmakers was eating, and several were raving over the wings. It's open from 2 p.m. until 2 a.m.
Jamie's Italian (Deck 11); $35: The fresh, house-made pasta is the centerpiece at Jamie's Italian -- a concept from British chef and personality Jamie Oliver -- but it's not the only thing to get on this well-rounded menu of updated Italian classics. Appetizers like the antipasti plank, giant green olives and garlic bread are family-style dishes, but others, like the bruschetta (a traditional tomato or a fresh crab and avocado version), are smaller portions fit for one with a healthy appetite or two looking to try a variety from the menu. There are several pastas on offer, from tagliatelle Bolognese and crab spaghetti to linguini, as well as baked lasagna. The lamb chops scottadito, fresh crab spaghetti and tagliatelle Bolognese are popular dinner options, and the simple baked lasagna and pan-roasted salmon graced many a table. Desserts are classic Italian, featuring affogato and tiramisu. Mains and pasta dishes are sizable, but not overwhelming. Still, if you have a smaller appetite, pastas are offered in smaller portions. It's open for lunch and dinner but closed from 1:30 p.m. to 6 p.m.; reservations are recommended. Chops Grille (Deck 11); $42: Chops Grille, the ship's steakhouse, occupies a twin space to Jamie's, and the two restaurants flank the entrance to Windjammer Marketplace. Chops serves steakhouse specialties in a room that tastefully blends classic and contemporary steakhouse styling. There are the expected dark wood panels, but it has been updated with modern shapes to the chairs, tables and plates. The menu has a half-dozen steaks to choose from (including two premium dry-aged options); a quartet of seafood dishes, including a half-lobster for the classic surf and turf; and a bevy of salads and starters that include a Caesar salad, seafood tower, shrimp cocktail and beef carpaccio. Also on the menu are sides like baked potatoes, truffled French fries and roasted mushrooms. On the wine list, you'll find a thoughtful bottle and by-the-glass selection (including several bold reds) that fits most budgets and pairs well with the menu. (If in doubt, ask your server. They know the wine and food and will guide you.) Open for dinner only, and the $42 charge is for a prix fixe menu (with add ons, like dry-aged steaks). We and several other passengers found the filet mignon to be rubbery on our sailing, and the sides -- which we were told are designed for sharing -- are shockingly small, even for one person. However, other passengers we spoke with said the chicken is a standout dish. Johnny Rockets (Deck 12, aft); $6.95: Not to be missed for lunch, dinner or a late-night snack is Johnny Rockets, the old-timey burger joint serving tasty burgers, onion rings, fries, shakes and a side of throwback entertainment (in the form of singing and dancing waiters and cooks). Johnny Rockets charges an inexpensive cover and lets you order off the menu as you please, though iced tea, milkshakes and draft beer cost extra. Dine inside at the soda counter or the plush red leather booths, or dine outdoors at some of those same booths, but with an ocean view. A couple of hints: If you don't like to wait in line, aim to arrive at 11:30 a.m., just after it opens, or after 3 p.m. (and anytime at night). Another tip: You can order food "to go," and there's no additional charge, beyond the cover. Open from 3 p.m. to midnight. Ben & Jerry's (Deck 5); a la carte: Next door to the Promenade Cafe, the Ben & Jerry's ice cream parlor sells scoops, cones and milkshakes for a charge of $2.50 to $5. Cafe Promenade Coffee Bar (Deck 5); a la carte: At this small add-on to Cafe Promenade, you'll find a barista whipping up drinks ($2 to $4 for standard drinks, $7 for spiked versions of the same).